Mark J. Perry at AEI compares inflation rates for various good and services. 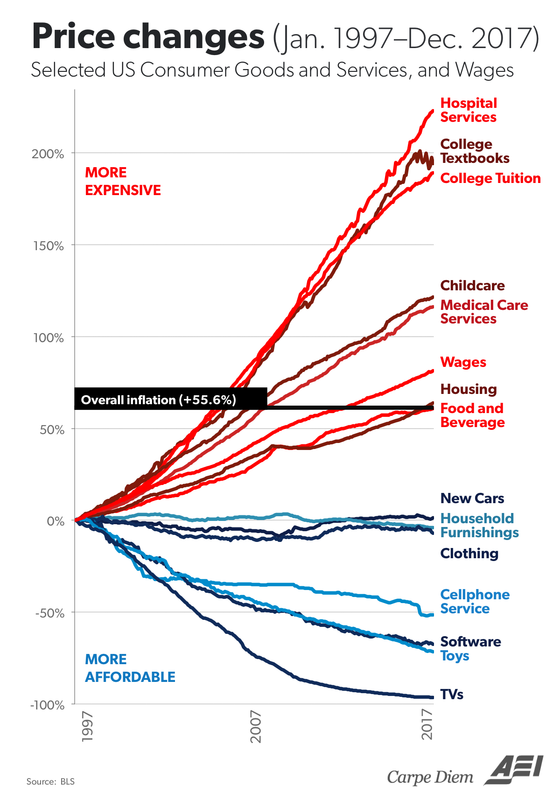 Textbooks and tuition, alas, are near the very top. The chart above (thanks to Olivier Ballou) is an update of a chart we produced last year about this time, and shows the percent changes since January 1997 in the prices of selected consumer goods and services, along with the increase in average hourly earnings in this version (which have increased by 81.5% over the last 21 years vs. the 55.6% increase in the CPI). See any patterns? Tradeables (with import competition like TVs) vs. non-tradeables (like childcare), manufactured goods (with import competition like clothing and cars) vs. services (medical, hospitals, education), competitive (software) vs. protected industries (healthcare), degree of government involvement/funding/regulation? Here are some comments from Twitter about the chart, which I posted there a few days ago and which has been re-Tweeted more than 200 times.